Small volumes of anti-LOXL1 antibody vial(s) may occasionally become entrapped in the seal of the product vial during shipment and storage. If necessary, briefly centrifuge the vial on a tabletop centrifuge to dislodge any liquid in the container`s cap. Certain products may require to ship with dry ice and additional dry ice fee may apply. Western Blot(WB), Immunohistochemistry (IHC), Immunocytochemistry (ICC), Immunoprecipitation (IP). 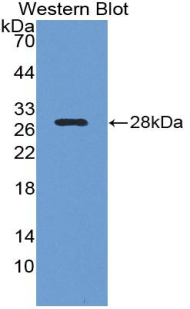 Western Blot: Sample: Recombinant LOXL1, Human. NCBI/Uniprot data below describe general gene information for LOXL1. It may not necessarily be applicable to this product. LOXL1: Active on elastin and collagen substrates. Genetic variations in LOXL1 are a cause of susceptibility to exfoliation syndrome (XFS); also called exfoliation glaucoma (XFG). XFS is a disorder characterized by accumulation of abnormal fibrillar deposits in the anterior segment of the eye. In addition to being a cause of glaucoma and glaucomatous optic neuropathy, exfoliation syndrome has also been associated with lens zonule weakness, cataract formation, and systemic vascular complications due to deposition of exfoliation material in extraocular tissues. Susceptibility to exfoliation syndrome is conferred by a risk haplotype that includes two LOXL1 coding non-synonymous SNPs (Arg141Leu and Gly153Asp) and one intronic SNP. Arg141Leu and Gly153Asp are sufficient to confer disease susceptibility in some populations. Belongs to the lysyl oxidase family. 1. LOXL1 is more abundant in the deposits in the iris region and, alternatively APOE is concentrated in the PEX material accumulated in the pupillary area of the anterior lens capsule.